Home - Health & Wellbeing Tips - What are Superfoods? minerals, amino acids, antioxidants and essential fatty acids. They have amazing protective and anti-ageing benefits. Here are some of our favourites that we use on our retreats. Goji berries grow on an evergreen shrub found in China, Mongolia and Tibet. They are dried shrivelled red berries that look like raisins. 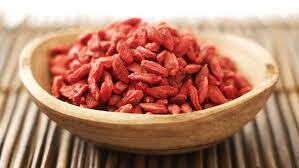 Goji berries have been used for over 6,000 years by herbalists in the countries where they are grown. Protects the liver and improves eyesight, sexual function and fertility. They boost immune and thyroid function, help improve circulation as well as promoting longevity. Goji berries are rich in antioxidants, particularly carotenoids, which can decrease the risk of developing age-related macular degeneration. Goji extracts may prevent the growth of cancer cells, reduce blood glucose, lower cholesterol levels and have been used as a treatment for hepatitis B as they help protect the liver. Maca is a dehydrated, cruciferous root vegetable from Peru. It is a medicinal food which has been in use for over 10,000 years around the world. Maca root can increase physical stamina, balance hormones and improve fertility. Menopausal symptoms: hot flushes, tender breasts, sleeplessness, emotional upsets, “brain fog” and vaginal dryness are all reduced. Chlorella is an algae so small it can’t be seen with the naked eye. It has a very high protein content-over 50% of its weight, and contains all the essential amino acids, vitamins and minerals we need for optimal health. Chlorella stimulates the healing, replacement and growth of human tissues, and is a potent detoxifier. Supports Immune Function: Chlorella supplementation has been shown to significantly improve the effectiveness of white cells: B lymphocytes (active against bacterial invasion), T lymphocytes (active against viruses and tumours) and macrophages (active against cancer, foreign proteins and chemicals). Improves Colon Health: Chlorella stimulates the growth of Lactobacillus, a powerful contributor to optimal colon health by 400%. It also normalises bowel function and helps prevent constipation. Detoxifcation: Chlorella’s tough cell wall binds with heavy metals (lead, cadmium and mercury) and removes them from the body. Improves Liver Function: Chlorella helps the liver resist toxins and recover more quickly from toxin exposure or damage caused by alcohol over-consumption. Flaxseeds and flaxseed oil are rich sources of Omega-3 Essential Fatty Acids as well as phyto-estrogens, important for female hormonal balance. Stress: Omega-3 fatty acids are the precursors for the Series 3 prostaglandins which regulate immune function and are responsible for reversing the body’s physiological response to stress. Spirulina contains the most remarkable concentration of nutrients known in any food. It’s the highest protein food with over 60% of it being digestible vegetable protein. It has the highest concentration of beta carotene, vitamin B12, iron and trace minerals and the rare essential fatty acid GLA. We have all experienced the positive feelings associated with eating chocolate, now we have access to pure raw unadulterated chocolate in the form of organic raw cacao. This is much more potent than the processed chocolate and doesn’t contain any sugar or dairy products. Antioxidant: Raw Cacao beans contain a high amount of antioxidants in stable form that are easy to metabolise. Promotes a Healthy Heart & Brain: Raw Cacao is the primary dietary source of magnesium, the most common mineral deficiency in Western civilisation. Magnesium is the most important mineral for a healthy heart and it plays a key role in producing energy for our brain cells, helping with clarity and focus. A Natural Antidepressant: Cacao is a great source of the neurotransmitters which are associated with wellbeing and a healthy mood. Barley grass powder is made from the dried young leaves of the barley plant. At the early stage of its growth, the barley plant is closer in composition to vegetables than grains, hence the name ‘barley grass’. As they grow, the nutrient concentration of its vitamins, minerals, enzymes, amino acids, and chlorophyll all deteriorate significantly. Barley grass powder contains very dense nutritional and healing properties in a concentrated form that is easily assimilated by our digestive systems. Barley grass also has a very strong alkalising effect on the body. It helps in cell DNA repair, acts as a free radical scavenger, improves skin health and helps to stimulate weight loss. Barley grass is said to be the only vegetable on Earth which can supply all the nutrients which the human body needs from birth to old age! It helps treat asthma and combats blood clots and cancer. It helps to reduce low density lipoprotein cholesterol (the ‘bad’ cholesterol) levels. Barley grass is helpful against diabetes and prevents blood vessel damage which could be caused by diabetes. Barley grass is also rich in living chlorophyll which is the basis of all plant life, playing a critical role in photosynthesis. It is anti-bacterial, stopping the development and growth of harmful bacteria and helps rebuild the blood. Chlorophyll is very similar in structure to blood haemoglobin. Liquid chlorophyll gets into the bodily tissues, rejuvenating and rebuilding them. It alleviates blood sugar problems, neutralises toxins in the body and helps to purify the liver. Wheat grass is prepared from the young grass of the common wheat plant and provides us with chlorophyll, amino acids, minerals, vitamins, and enzymes. It increases red blood-cell count and lowers blood pressure. It restores alkalinity to the blood and has been used successfully to treat peptic ulcers, ulcerative colitis, constipation, diarrhoea, and other complaints of the gastrointestinal tract. Contains beneficial enzymes which help us digest, metabolise and heal. It has remarkable similarity to our own haemoglobin which transports nutrients to every cell of the body. Wheat grass cleanses your blood and help rejuvenate aging cells, slowing the aging process and tightening loose, sagging skin. Chia seeds are native to Southern Mexico and Central America. The tiny seeds are about one millimeter long and are a mottled gray and brown. The seeds contain up to 25% Omega 3’s including ALA (alpha-linolenic acid) as well as protein and fibre and are considered a near-perfect food source. Weight loss: The tiny seeds have a unique gelling action which keeps you feeling full for hours. Balances Blood Sugars: The gelling action of the seeds and its unique combination of soluble and insoluble fibre combine to slow down your body’s conversion of starches into sugars. If you eat chia seeds with a meal it will help you turn your food into constant, steady energy. Helps prevent Diverticulitis & Diverticulosis: To help ensure regularity, you need plenty of soluble and insoluble fibre in your diet. The insoluble fibre is unable to be digested, so instead, it helps keep food moving smoothly through the intestines. Soluble fibre and the gel coating of the seed keep the colon hydrated and ensure the easy movement of food along the colon. High amounts of healthy omega-3 oils: Chia is the richest plant-source of this healthy oil. Omega 3 oil is important in heart and cholesterol health as well as promoting weight loss. Improves energy: Chia seeds are one of nature’s highest plant-based sources of complete protein which helps raise energy levels. The combination of its complete protein, vitamins, and minerals all work together to make sure you have consistent energy levels. Anti-ageing & Anti-oxidant properties: Contains high amounts of anti-oxidants which help prevent free-radical damage to our bodies which can lead to premature aging of the skin and inflammation of various tissues. Cuts food cravings: Vitamin or mineral deficiencies can cause food cravings. For example, if you’re low in magnesium you may crave chocolate. Chia seeds make you feel full for longer and prevent cravings.